If you are looking for affordable, professional residential or commercial pressure cleaning, certified non pressure roof cleaning, power washing, building mildew removal, or flat work surface concrete cleaning in Richmond, VA, you need not look any further. 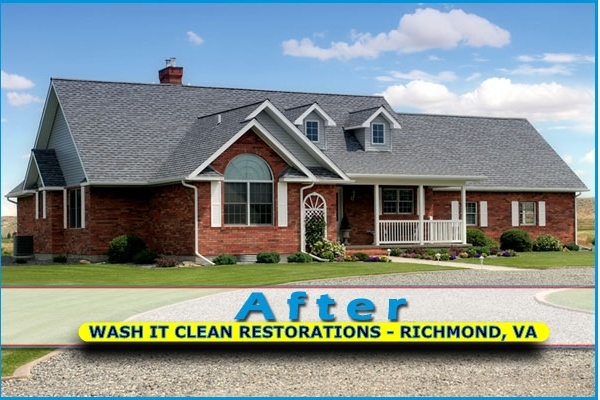 You have found the right licensed and insured CERTIFIED roof cleaning contractor for your next Richmond, VA and surrounding area roof cleaning, pressure washing or power washing project. We keep busy year round. Why? Because we do it right the first time. Wash It Clean Restorations we stands behind our workmanship with our quality workmanship guarantee. we treat our new and existing customers like we ourselves would like to be treated, which means we honor and respect “the golden rule”. Strong work ethics and “old school” values are our cornerstones which is why past customers call us back year after year. Call or text us on your smart phone today ! Our estimate calenderis closing fast so schedule your very own personalized, no obligation estimate now! Did you know? Wash It Clean has been in business since 1986 and is very highly regarded in the Richmond VA area for our exterior cleaning services. The key to our success is making you and your unique project and situation, our priority! OUR CLEANING TECHNICIANS ARE STANDING BY TO SERVE YOU NOW! Free up your weekends and let us handle your toughest outdoor roof stains and projects for slate roof cleaning and tile roof cleaning. We make it EASY to enjoy your free time off work and not be burdened with the hassle and stress of tackling difficult power washing, sidewalk and driveway cleaning, gutter and facia cleaning and restoration and difficult roof stain removal projects and more. Exterior cleaning. No problem. We do it all safely, cost effectively, and professionally! Wash It Clean is a proud member of the industry leading non pressure roof cleaning organization, the RCIA (Roof Cleaning Institute Of America) and is CERTIFIED as a safe, non pressure roof cleaning professional. Having over two deacdes of power washing and pressure cleaning contracting experience means we handle every exterior cleaning need. Wash It Clean Is successful because we provide real results and measurable value to residential and commercial property owners. Let us, show YOU how, we EARN your business! We strive to always remain courteous, professional, and timely in whatever we clean and maintain for our customers. Our Customer Mission Statement is to consistently do it right, the first time, every time! 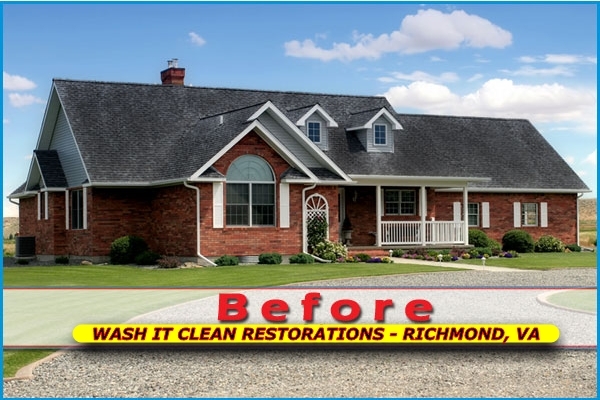 Kindly give Wash It Clean pressure washing, roof cleaning, and power washing Richmond Virginia a call at 804-687-4960 today! Service Areas include the entire Central VA region: Richmond, Glen Allen, Tuckahoe, Mechanicsville, Hanover, Bon Air, Midlothian, Powhatan, Henrico, Chester, Chesterfield, Charlottesville, Williamsburg, Northern Neck, Prince George, Sandston, and Goochland. Don't Replace it - Clean It! An estimated 50% of all roof replacements are due to roof stains and not a defective roof! Our 100% guarantee means no risk!